Following the advice of my peers, I canvassed a number of roofing companies for quotes; one of them, Imperial Roofs, had recently done work on one of my neighbour’s rooftops – they went on the list due to a referral and a visible example of quality workmanship. Stefan from Imperial Roofs was thorough from the get-go: he did a full inspection of the roof before we even sat down to talk about anything. He went back to his vehicle, wrote up the quote, and then asked to sit down for a bit to talk about a few things. 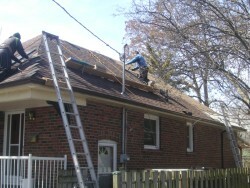 The guys from Imperial Roofs at work. 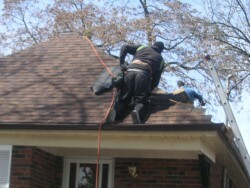 Roofing is tricky because it is a self-policing industry in Canada. There is no real governing body that watches over them, so pretty much anyone can put themselves out there to make some cash. Imperial Roofs is a fully insured outfit that is in good standing with the WSIB (the last thing you want is for someone to get injured while repairing your roof and then finding out that you have to foot the medical bill). They ensure that you understand everything that they do (and will be doing on top of your home) so that you can make informed decisions – after all, your roof is one of the key parts of your house that keeps you and the contents of your home safe from the elements. Stefan walked me through his recommendations and we also discussed a few extras (building a new downspout and installing a new exhaust vent for the bathroom). After this was done, he showed me the price (one of those double-take moments, in a good way) and I told him I would get back to him after he provided me with a referral. A shot from the side. 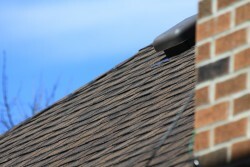 It’s a good idea to get referrals, of course, but its an even better idea to make sure that at least one of those referrals involves the roofing company making a mistake. Why? Because it is a good idea to see how that company handles a situation where they are in the wrong. Stefan was understandably curious when I asked him for that reference; however, he was forthcoming, providing me a number to call (and getting permission from his other customer) within the same day. I phoned the reference immediately, asked what I needed to ask, and then emailed Imperial Roofs to give them the thumbs up. The crew arrived in the morning (around 9) and started staging; tarps were set up all around the perimeter of the house and all of their tools were laid out. Stripping started quickly. I didn’t watch it from the outside, but a few peaks into my attic revealed that they were very efficient. 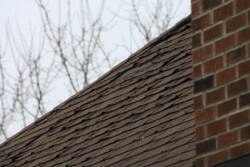 One thing to note: when your roof is stripped, chances are good that your attic may get dirty. 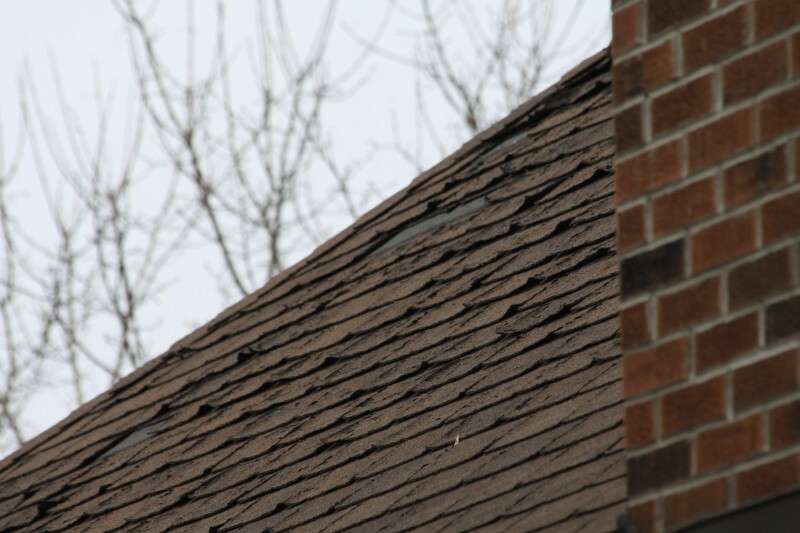 Dust and grit from the several layers that make up your roof could fall between the boards of your roof and coat your attic floor. This is unavoidable (and nothing a good vacuuming won’t fix). 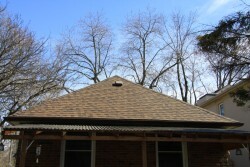 A shot of the roof after they were finished. At times during the day I would look out the basement windows at the mess of shingles that lay all over the tarps; but there were also people constantly cleaning up. The whole operation appeared well-practiced and everyone worked together really well. It only took a few hours for them to strip the roof and prep for the next part. As mentioned earlier, I had asked for the installation of a vent as an outlet for our bathroom exhaust fan. They asked where I would like it; upon telling them, they fished up the hose (which was already hooked up to the fan output) and attached it to the vent. In fact, all vents were re-done. Base layer, ice shield, new flashings and shingles all went up quickly and efficiently. I had asked for Landmark 30 year (limited lifetime warranty) algae-resistant fiberglass-core architectural shingles. 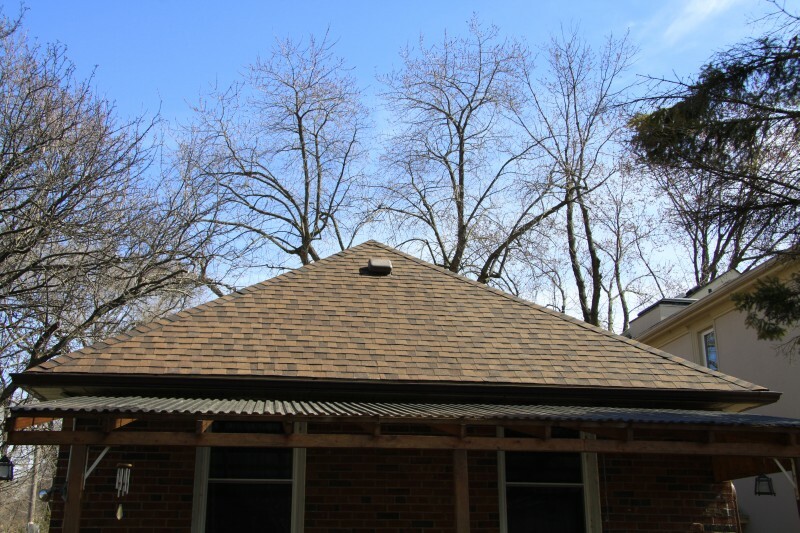 They didn’t have the exact colour as our old shingles in that style, but we didn’t mind – we chose a colour that was close to what we used to have. During the project, a new rain barrel from Riversides arrived. I helped Stefan set the patio stone base, and him and his guys happily did the rest, installing a new downspout and ensuring a good fit. 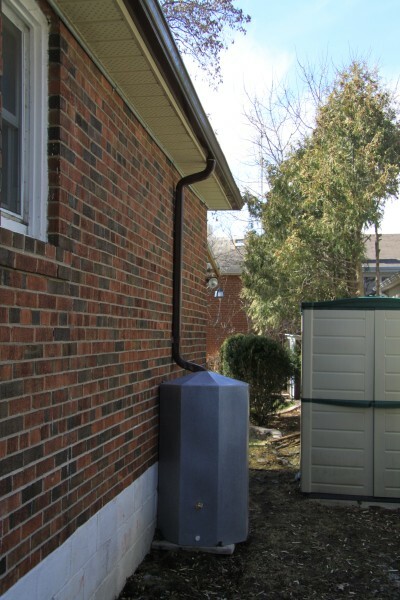 A picture of our Riversides rain barrel. They didn’t really bother me at all during the day. Other than a quick chat about the rain barrel and the bathroom vent, they stuck with our original plan. I remember looking outside and watching some of the guys do a magnetic sweep of the area to pick up any spare nails and metal debris. The next thing I knew, Stefan was ringing the front doorbell to indicate that they were finished. We did a walk-around to look at what was done, signed the papers and exchanged the money. It was three o’clock. Imperial Roofs took the guesswork out of something complicated (for me). They delivered on time and for the price that they quoted and they even threw in a few extras (rain barrel, for example). I am really happy with the work they did, and they are obviously happy with what they do, because they stand by their product. I’m sure I sound like a commercial, but what can I say? They do good work!